Take your relationship to the next level with these expressive accessories and gems that are as precious as your love. A string of bees are immortalised in a honey-hued gold bracelet from Bulgari’s Festa Delle Principesse range. Studded with blue sapphires and diamonds in yellow and white, this is an unusual way to express your attraction to her sweet nature. The queen of your heart deserves a trinket worthy of royal approval… like this Tory Burch striking blue gem ring. A colour symbolic of antiquity, this ring features a buttery gold shade, complemented by floral patterns and blue enamel that’s a priceless heirloom. Take her breath away with DeGem’s sapphire rings from the Infinity Precious collection. With alluring shades of pink and blue, the gems that represent love, truth and fertility will win her heart. Read also: How Is The World's Most Beautiful Diamond Made? An Insider Tells Us. In tribute to the new Cartier Love collection, 3 rings designed after the Seventies are modernised in yellow gold, white gold and pink gold, encircled with a string of diamonds, intertwined with the Cartier logo. A very rare, 342-carat diamond is the centrepiece of Chopard’s most precious jewellery set, aptly named the Queen of Kalahari. As part of the collection is a ring bearing a 20-carat, cushion-cut diamond, with brilliant-cut stones upon white ‘Fairmined’ gold. The unending symbol of eternity, the De Beers Infinity Solitaire ring sparkles with white pave diamonds set in an 18K rose golf band, made to perfectly fit alongside the De Beer Infinity band to complete the bridal jewellery set. Also centred on the infinity symbol, the Forevermark Endlea diamond ring reinterprets the flowing ribbon motif into an elaborate design, decorated with only the finest, rare, and responsibly sourced diamonds. A combination of precious materials of white and rose gold, the DeGem Sandy collection wedding bands are contemporary yet timeless for couples, with an added jewellery technique milgran central engraving representing longevity, as a memento of a lifetime. Solid, strong, and passionate – three messages evoked by the Lukfook 18K red and white gold diamond couple rings that capture the beauty of love. Nimble diamonds in the centre of his- and-her rings anchor geometric carvings, in synchronised strength and beauty. What better way to elicit a 'yes' to the all-important question, than with a pair of statement ‘Oui’ earrings from Dior? 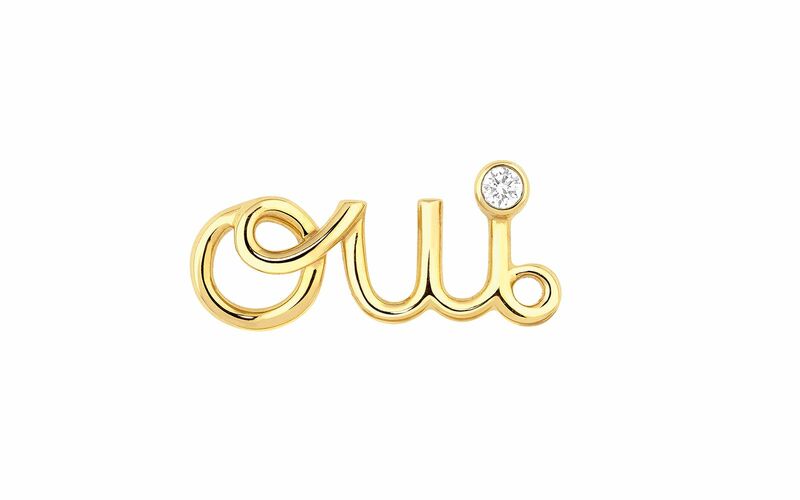 Made from a polished, yellow gold and finished with a diamond, these earrings made from 3 letters mark the start of a new chapter in your relationship.